TOP: Tselani towers over where the original Salina Trading Post stood, which is about five miles south of the present Tsalini/Cottonwood Chapter House. 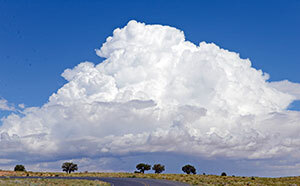 BOTTOM: Rain clouds begin to form in the distance over juniper trees east of Tselani/Cottonwood Chapter. The elders of Tsélani were upset. Sitting around comparing notes one day, they had discovered not one of them could read or write. Not only that, neither could their children. The nearest BIA boarding schools were miles away over clay roads that were impassable much of the year, and besides that, they needed the kids home to help with the chores. It was the 1950s, the reservation was rapidly transitioning to a cash economy and without an education their children and grandchildren were going to be mired in poverty while the rest of the reservation progressed. The more they thought about it, the madder they got. Finally they got mad enough to march into the BIA office and demand a school. To their surprise, the BIA agreed to staff a school provided the local Navajos built the building. The elders raced home and commenced construction. The resulting school opened its doors in 1954. It was little more than a log cabin, but it sufficed until the BIA replaced it in 1968. Today, the Cottonwood Day School serves about 200 students from all over the vast area between Chinle and Piñon, and continues to be a monument to self-determination. A little after the school was built, Tsélani/Cottonwood Chapter did a similar thing for its elders. A woman named Mary Totsoni observed that the seniors in the area were lonely. Bad roads made it hard for them to visit each other, and some weren't eating right. She envisioned a place elders could drop in any time they wanted, eat a nutritious hot lunch, visit and do arts and crafts. According to former chapter president Billy Nez, 85, she traveled to Washington, D.C., to request funding for such a structure, and supplemented the appropriation with funding from the state of Arizona. It was the first senior citizens center on the reservation, and the idea spread like wildfire. 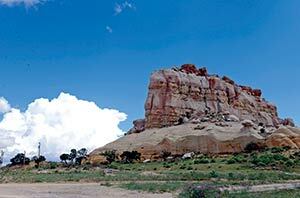 Today, most of the Navajo Nation's 110 chapters have a senior center. Tsélani/Cottonwood's still has a special feel though. "We don't just sit around," said its supervisor, Velma Yazzie. "We go on trips, we do activities, we make a lot of crafts. We have movie days every Friday, puzzles, games, exercise. We have 15 or 16 home delivery clients." In spite of budget cuts at the chapter level, Yazzie has been able to keep all the programs going through an enthusiastic network of volunteers. When the Times visited last Thursday, two were working in the kitchen, one was serving food and two were helping with the crafts. "The volunteers are wonderful," Yazzie said. "I especially like it when young people come in. The seniors love them, and the youth can learn so much from them." A senior council advises the chapter administration on the needs and priorities of local elders. Adjacent to the senior center is a group home owned by Toyei Industries Inc., which provides semi-independent living space and work for people with disabilities. Fighting for their children and seniors came naturally to the people of Tsélani. These folks have always been warriors. Name: Sometimes incorrectly Anglicized to "Salina," Tsélani means "Many Rocks" and refers to a spectacular field of white rock sentries against the mesa behind the town. The neighboring community of Cottonwood, on the flats toward N4, is named for a giant cottonwood tree under which the people used to meet. It has long since died but the same species was planted in front of the chapter house and is getting pretty big. Today, the intricate maze of white rock spires (the "many rocks" of Tsélani) backed by a steep mesa inspire awe and tranquility. Back in the 1600s and 1700s, they inspired fear in the hearts of Diné enemies. If a raiding party of Utes or Spaniards happened to chase the Navajos into this cove of sculpted stone, woe unto them. There was no way they were going to survive. Warriors positioned themselves behind the spires and high on the mesa top, raining arrows seemingly from nowhere upon the unsuspecting foe. "They couldn't chase us up there," explained Nez, speaking in Navajo with Yazzie interpreting. "Nobody could climb better than the Diné." Today, people climb among the spires for fun, although you have to be careful, as they're made of a crumbly siltstone. Another good place to hike is Fish Point, the rhinoceros-horn-like projection on the north side of Navajo Route 4, so named because of the shark's teeth and other marine fossils you can find there. Figuratively speaking, the chapter is trying to climb, but footholds are far between. Although it's about halfway between the fairly major communities of Chinle and Piñon, Tsélani/Cottonwood has been long neglected because of its frightful roads. The red-and-white siltstone weathers into clay that leaves even four-wheel-drives spinning their wheels at the barest addition of moisture. Electricity didn't get here until the 1960s and running water is still just a dream for much of the population. Navajo Route 4 was paved between Cottonwood and Piñon just a few years ago, reducing commute time by about half and enabling Tsélani/Cottonwood locals to find work in the schools, IHS clinic and handful of businesses in that small burg. There were once two trading posts, one in Tsélani and one near the road in Cottonwood, but the last one went out of business in 1993 after the Navajo Nation refused to renew the business-site lease. There are plans to demolish it and build a gas station, but whether it can compete with the popular Blue Gap store just six miles down the road remains to be seen. A cemetery is on the drawing board, along with a second Navajo Housing Authority development, police station and fire station. The chapter is also trying to find funds to replace its Head Start building, which was critically damaged during last year's monsoon. The BIA keeps promising to fix N251, the road to Fish Point that is now a kidney-jostling mosaic of the local clay and ancient scraps of pavement from some long-ago project. It's an ambitious agenda for this little chapter most people barely notice as they whiz between Chinle and Piñon. But look what they've been able to accomplish so far, with little more than grit, persistence and community spirit. Don't count Tsélani/Cottonwood out just yet.